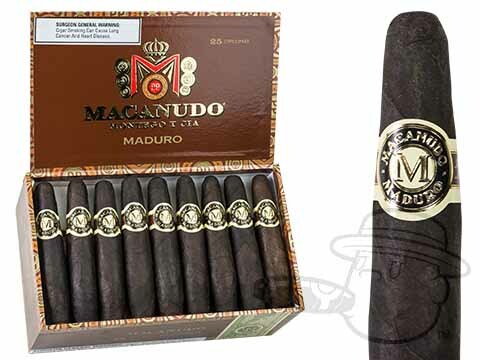 Macanudo Maduro cigars offer all the richness of the fullest-flavored Connecticut Broadleaf wrappers and all the smoothness that you expect from this leading premium cigar brand. Crafted in the Dominican Republic using the very best of Broadleaf wrappers from the Connecticut River Valley, Macanudo Maduro cigars are creamy and slightly sweet with mellow-to-medium strength and gentle notes of cocoa, cedar, and spice. Macanudo Diplomat Maduro brings you warm and welcoming maduro character in a short, stout 4 1/2 x 60 vitola. Macanudo Diplomat Maduro is rated 4 out of 5 based on 1 customer ratings.